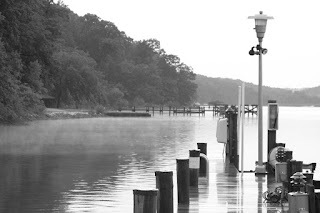 South River Topwater Fishing: Rain Out? It has been way too long since my last post. Fished every day for at least an hour. Striper fishing has been very tough. Between high winds and bad tides for the last hour of light, I had my longest slump ever...19 straight days. Stuck with TW..it was tempting to give in and throw a curly tail, but worth it. Finally on Sunday night after Brad's wedding I got into them out at Thomas Point Shoal. No frenzy, but steady action...6 from 16-18 and many more blow ups. Tonight started out with a massive thunder storm rolling thru. Headed down to boat around 7. It was still drizzling, but headed out anyway. Headed to the point. It was perfectly still...no wind, no boats, no human sounds at all. With the addition of a surreal fog hanging over water it was a PERFECT topwater night. I just felt it. On the third cast I picked up a fat 20 incher. It sounded like a gun going off when the fish slammed. Actually mumbled to myself afterwords "that was awesome"